The holidays can be a very stressful time. 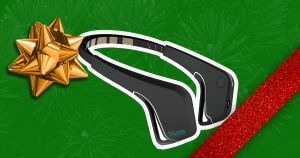 So this year, why not give the gift of mental tranquility with the Muse Brain Sensing Headband. It’s designed to act as a “personal meditation assistant” that helps guide users to a calmer mind. The app-controlled device is said to sense the real-time state of a user’s brain. It then analyzes the data to select the best meditative sounds to play through the device’s headphones. As a result, users “experience all the benefits of meditation – such as relaxation, improved mood and reduced stress – with none of the uncertainty.” The product also offers “personalized tracking, motivational challenges, and rewards that encourage you to build a more regular and effective practice.” And it’s the only gift on the list that might eventually lead the user down a path to total consciousness. So it’s got that going for it, which is nice. Buy Muse here. Futurism fans: To create this content, a non-editorial team worked with Muse, who sponsored this post. They help us keep the lights on. This post does not reflect the views or the endorsement of the Futurism.com editorial staff.